07:43 It’s a big 90 minutes coming up or 2013 GP2 champion Fabio Leimer, he’ll make his F1 debut in this session with Manor. The team’s reserve will stand in for Roberto Merhi this morning. 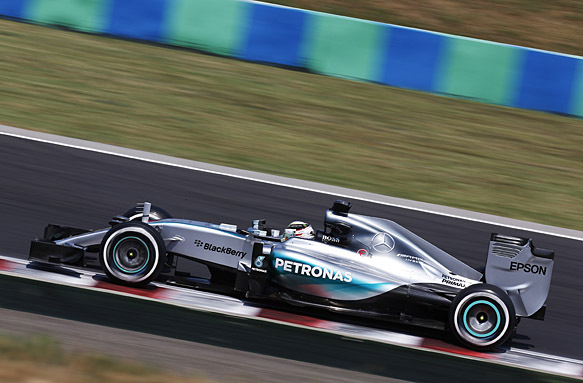 07:44 Good morning and welcome to AUTOSPORT’s live coverage of the Hungarian Formula 1 Grand Prix. 07:44 We’re about 15 minutes away from first practice and - as always - you can follow all of this weekend’s action right here. 07:45 The final event before F1’s traditional summer break, it’s suitably warm and sunny in Budapest, high-20s at the moment. @pirellisport: Good morning from #HungarianGP! And it's already 26 degrees centigrade ambient, 35 degrees on track. 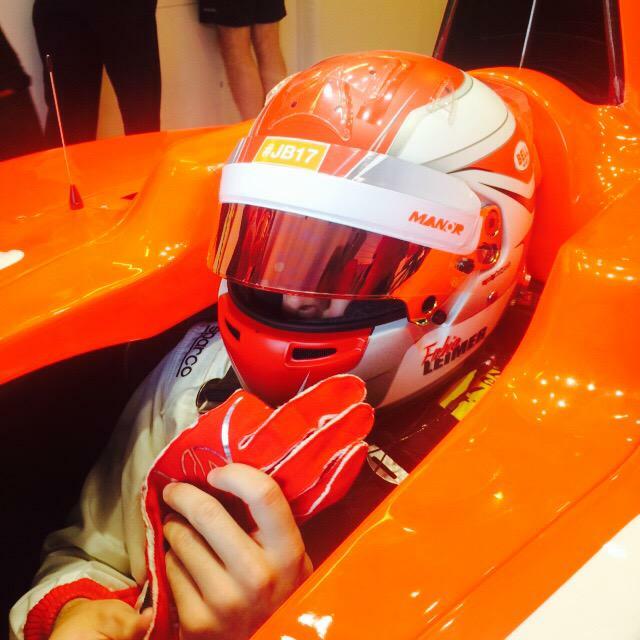 07:48 Of course, this weekend will take place with Jules Bianchi firmly in the memory of not just the F1 paddock, but the entire motorsport community. 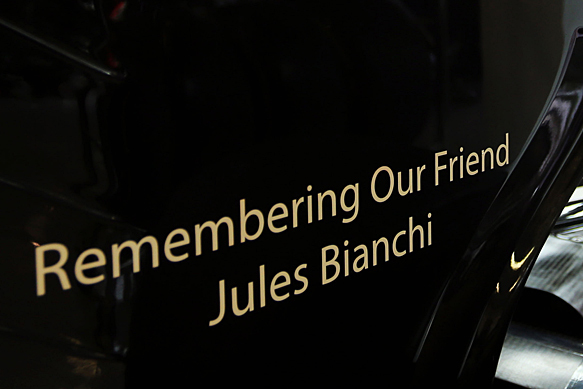 A number of tributes are planned, including a pre-race minute of silence, while teams and drivers will also run graphics to remember the Frenchman. 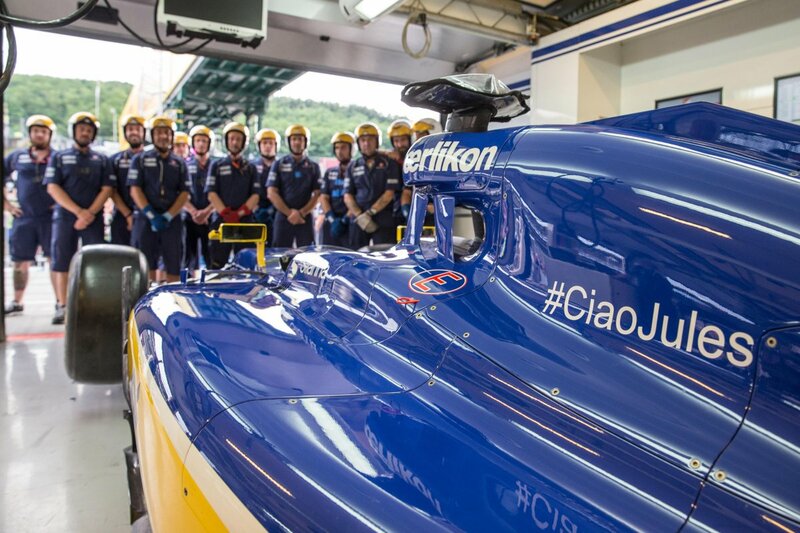 07:51 Every team will run a tribute of some variety on their cars this weekend, we’d love to post them all, but Sauber gets the nod for having its crew in the photo as well. 07:52 As F1’s ongoing safety push continues in the wake of Bianchi’s accident, Lewis Hamilton says he is open to the concept of F1 adopting closed cockpits, something the FIA has tested in the past. 07:53 Also from the paddock yesterday, Sebastian Vettel believes Ferrari team-mate Kimi Raikkonen is still one of the most skilled drivers in Formula 1 and has no doubt about his ability. 07:54 While down at Vettel’s former team, Daniel Ricciardo expects the next two weeks to bring more clarity about Red Bull's future Formula 1 engine supply as it awaits improvements from Renault and considers its alternatives. 08:00 FP1 is up and running - plenty of cars heading straight out with aero rakes attached, as is permitted in this session. 08:03 Kvyat reports that only one of his earplugs is working, in radio terms, so he's only hearing the communication from the pitwall in one ear. 08:03 We currently have Hulkenberg, Perez, Bottas, Stevens, Vettel, Sainz, Nasr, Ricciardo, Leimer, Verstappen, Ericsson, Raikkonen and Kvyat out completing installation laps. 08:05 "No practice start, just constant speed as before. Last time was good," - Toro Rosso to Sainz. 08:06 As expected, most of those cars have returned to their garages for checks, with only Sainz staying out. 08:06 Kvyat has headed back out, while Alonso, Rosberg and Button are out for their first exploratory tours. 08:08 "Multi 1, exit Turn 11," Red Bull tells Kvyat. Not quite as earth shattering as 'Multi 21' from the Malaysian Grand Prix a few years back. 08:09 Rosberg smashes the second kerb in the chicane, bouncing the Mercedes wide and getting out of shape as he gathered it all together. Lively moment for this early in FP1. 08:09 Rosberg logs the first time of the session, a 1m29.215s. 08:10 Verstappen's had a lock-up approaching the pit speed limit line. 08:10 Rosberg is reporting "a lot of oversteer". 08:10 The fastest time we saw in this session last year was Hamilton's 1m25.814	s.
08:10 Rosberg's not wrong - his car's back end has just stepped out under braking for the penultimate corner. 08:11 Hamilton reckons he had a bit of wheelspin on his practice start. "Yep, correct," is the response he gets, as if he was being tested. 08:11 Looks like Hamilton's head rest has come loose, he's coming back to the pits. 08:11 Rosberg improves, though, to a 1m28.536s. 08:12 Stevens, Nasr and Verstappen are the other cars on track at the moment. 08:12 It's a quick change for Mercedes, giving Hamilton a new headrest in the pitbay so he can rejoin quickly and get on with his run. 08:13 "The left hand side of the headrest was making a buzzing noise, like there was a bee in there," - Hamilton. 08:14 Rosberg chips away again, a 1m27.306s. Ericsson, Raikkonen, Kvyat, Massa and Hamilton - headrest sorted - are also now out. 08:14 Rosberg is still not happy with the back end of his Mercedes, he's asking the team to check the settings because he has "oversteer on entry", as we saw earlier. 08:15 Verstappen becomes the second driver to log a time, it's a 1m30.087s. 08:16 Hamilton sets his first time, straight to the top with a 1m26.286s. 08:16 Times, too, from Raikkonen, Ericsson, Nasr and Stevens. Raikkonen the fastest of that bunch on a 1m29.001s. 08:18 Raikkonen has wobbled wide at Turn 1. Ferrari warned him at the start of this run that it'd take his tyres a few laps to get up to temperature this morning. 08:18 From BEN ANDERSON trackside: "Massive wobble for Raikkonen under braking for Turn 1. "Almost lost the rear completely. Next time through he is just as aggressive but turns in earlier to avoid the oversteer. The result is a front lock-up and missing the apex." 08:18 Hamilton improves to a 1m25.291s. 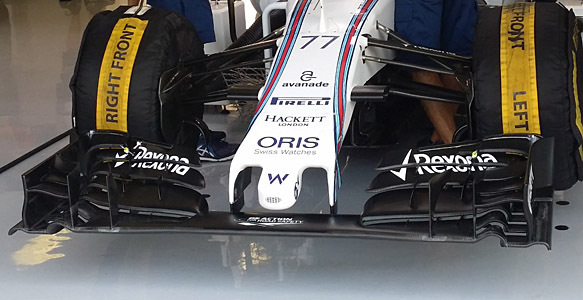 Nasr, Massa and Bottas have all recorded times in the 1m28s. 08:20 Raikkonen sorts a clean lap, it's a 1m27.215s, just ahead of Rosberg, who is also back on track. Only Vettel, Button and the Lotus pair - they're yet to appear - on track at the moment. 08:21 Rosberg gets back up to second, a 1m26.221s. He was fastest through the first sector. 08:22 "Sainz is blocking me," Kvyat reports, who backs off to find some clean air before the Toro Rosso driver. 08:23 Leimer is on the board as a GP driver, his first time is a cautious 1m36.590s. 08:23 Hamilton goes fastest through the first two sectors but doesn't improve overall. He's still on top, almost a second clear. 08:24 A total of 18 cars on track, only Vettel, Kvyat and the Lotus pair not out there. 08:24 Raikkonen is given some settings tweaks to make, and he abruptly responds "I can only make the changes on the main straight, it's difficult to do it where you said." It is a twisty track, so we can understand his point. 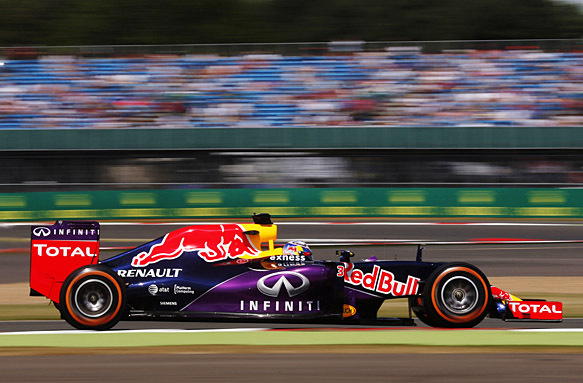 08:25 Last year's winner here, Ricciardo is now third, with a 1m26.838s lap. Rosberg has returned to pitlane, along with Stevens. 08:26 "I had a moment at Turn 1 so this lap is ruined," says Hulkenberg. 08:27 Just three minutes until the track will fall quiet, when the teams have to give back their first set of FP1 tyres. 08:27 Sainz improves to sixth, with a 1m27.344s. Hamilton still fastest from Rosberg, Ricciardo, Raikkonen and Verstappen. 08:28 Alonso goes seventh on a 1m27.526s. McLaren is looking for an improved showing this weekend, on a less power-focused circuit. Which F1 teams should be optimistic for the Hungarian Grand Prix? 08:28 Ricciardo is a TV director's delight - having a huge slide in the chicane that makes for a great super slow-mo replay. 08:28 Maldonado and Palmer have both headed out for Lotus for their first laps of this session. 08:29 They'll have the track to themselves, essentially, Button is the only other car out there. 08:30 That trio have also now pitted. 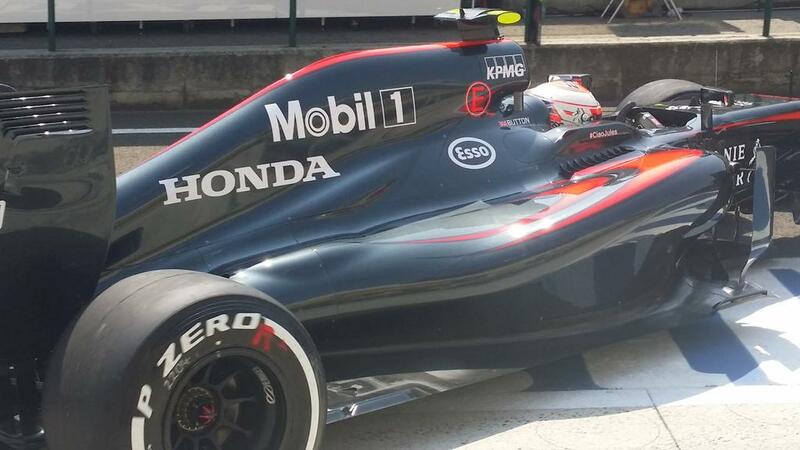 08:30 Button asks McLaren to "have a look at braking". 08:31 Here's how it looks at the end of the first half an hour. No times logged yet by the bottom four. 08:32 Verstappen has been the busiest driver of the first third, completing 13 laps. 11 each for Hamilton, Rosberg, Raikkonen and Sainz, and 10 for Bottas, Nasr, Massa and Ericsson. 08:33 On Ericsson - if you missed the news yesterday - Sauber has confirmed Ericsson and Felipe Nasr will again drive for the Formula 1 team in 2016. 08:37 More from BEN ANDERSON down at Turn 1, on the outside of the track by the 50m board, to be precise. During the traditional lull at the end of the first 30 minutes, he'll have a few minutes to hear himself think. "Verstappen and Nasr are flirting dangerously with the white line at the edge of the circuit. It should give them a fractionally wider and faster entry, but it's dirty out there and causes oversteer when they turn in. Slightly narrower approach is required." 08:39 BEN ANDERSON: "Raikkonen is interesting here - he's super aggressive on the brakes but either loses the rear when he turns in conventionally or locks the front and misses the apex when he turns in earlier to negate the oversteer. "Probably needs to brake a little bit earlier to get things better under control, though his persistence with an aggressive braking point is spectacular to watch." @MercedesAMGF1: Latest track / air temps soaring up to 40 / 30 degrees respectively: and it's only 10:30! "Rosberg looked very fast but controlled entering this turn. Very few lockups and looks as though he has the car doing the work for him. "Hamilton, Alonso and Ricciardo also seem to have struck the right balance between aggression and control, but they are a little more dynamic and always seemingly on the edge of locking the inside front too much." 08:47 And we now have some cars back on track, the Saubers, Perez and Verstappen. 08:47 Nasr starts a run with "wheelspin when I dropped both clutches", and a lap later he locks up at Turn 1, going wide. 08:48 Sainz joins them, a couple of minutes into the second half of this 90-minute session. 08:49 Ericsson is also suffering from wheelspin, he's been told to "push the maximum" on his out lap. 08:49 Perez goes fifth-fastest with a 1m27.025s lap. Raikkonen, Leimer, Vettel and Kvyat also on track now. 08:51 Vettel logs his first timed lap, it's a 1m26.687s, to go seventh. 08:52 Raikkonen improves, he's now second, on a 1m25.812s, half a second shy of Hamilton. 08:52 Kvyat is now fifth, having also improved, with a 1m26.508s. 08:53 At the other end of the order, still just the single installation lap for the Lotus pair, while Leimer is down to a 1m31.864s in the Manor, four tenths off Stevens. 08:54 Kvyat goes fourth-fastest, on a 1m26.257s, just ahead of team-mate Ricciardo. 08:55 More dramas for Nasr at Turn 1. He locks up again, and this time the rear of the car gets out of shape. He catches it nicely, but that's another lap destroyed. 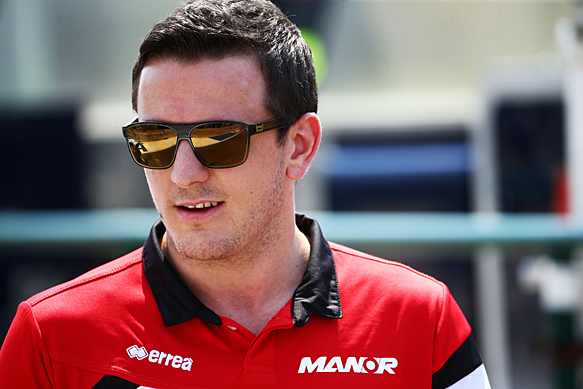 08:56 BEN ANDERSON: "The wide line has caught Nasr out there - got his tyres dirty and almost lost the rear." 08:56 Perez is told that his time gain looks good, Force India say that others have "gained around half a second." 08:56 Vettel is touring back to the pits, more problems. "Loss of power". 08:57 Huge crash for Perez, the Force India is upside down. 08:57 "I'm ok," says a heavily breathing Perez. 08:57 Perez is out of the car. 08:58 Perez ran wide out of Turn 11, then the car got out of shape and spat him into the inside barrier. The car then seems to dig into the grass and rolls over. 09:00 That looks like a right-rear suspension failure pitched him across the road into the barrier, and when the car bounced off the barrier, the broken suspension allowed it to tip over. 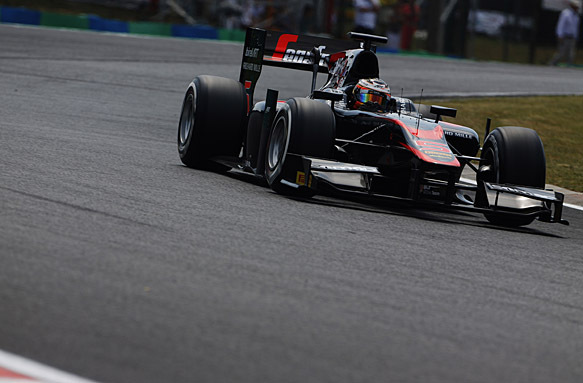 09:00 Perez was eighth in the order, on a 1m26.776s lap. 09:01 Plenty of drivers were quickly told on the radio not to be alarmed, and that Perez is ok.
09:03 The Force India is still upside down on the track while Perez returns to the paddock. Marshals are sweeping the track of all the dirt that was dragged onto the circuit. 09:05 The Force India has been turned back over. It's always painful watching an F1 car be dropped back on its wheels with a thump - especially for the mechanics. Time to get the car onto a recovery truck and take it back to the paddock. 25 minutes to go in FP1. 09:06 Powder is being put down to dry-up some fluids on the track from where the car came to rest. It's well off the racing line though, so it shouldn't affect anyone's FP1 running once the cars head back out. 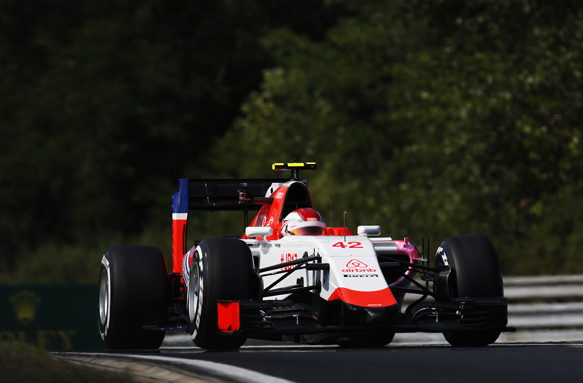 Analysis: Will Williams slip back the Formula 1 order in Hungary? 09:07 Perez is walking out of the medical centre after precautionary checks, and he waves to the crowd in the process. 09:10 Perez has just spoken to Sky Sports, and from the sound of it he's not aware at this stage that his car suffered a failure. He seemed to be pointing the blame at dirty artificial grass on the outside of the track. 09:12 Ricciardo is told to "go and sit by the end of the pit lane, we have two minutes to go." 09:12 @MercedesAMGF1: "With a little over 20mins of #FP1 to run and red flags still out, expect to see a busy track when that pit lane opens." 09:13 The session has resumed, with 17 minutes to go. 09:13 "OK Lewis, we need to let the Red Bull go first, you are second on track," Hamilton is told. 09:14 Hamilton - who didn't run during that last segment - Rosberg, Raikkonen, Ricciardo, Vettel, Sainz, Button, Bottas and Massa go straight out. 09:14 Raikkonen and Verstappen join them for this final flurry. 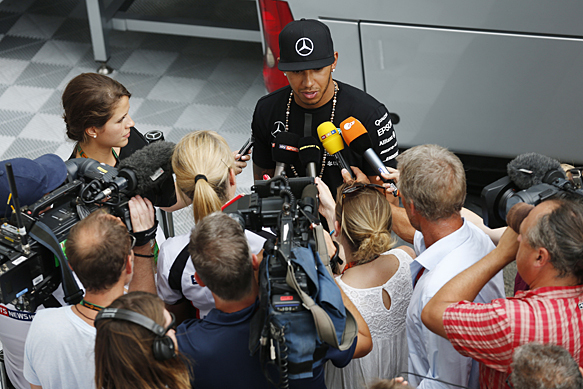 09:15 Hamilton says his practice start "felt too aggressive." 09:16 Rosberg is advised to "back off until he has everything warm." 09:17 Massa improves to 13th, with a 1m27.318s. Hamilton, meanwhile, sets a purple first sector. 09:17 Only Perez, Alonso, Hulkenberg and Palmer not on track at the moment. Maldonado is out for his first proper running, with 15 minutes left. 09:18 Bottas has jumped up to ninth, on a 1m26.894s. 09:18 "I'm afraid I can't say Lewis" is the reply to Hamilton, who asked how his sectors looked. 09:19 Hamilton didn't improve on that lap, after going fastest of all through the first sector. 09:19 Rosberg improve to a 1m25.498s, he's now two tenths behind Hamilton. 09:19 Ricciardo's Red Bull drives through the final corner as if its rear tyres are on ice. Phenomenal amount of effort required to keep it pointing roughly in a straight line. 09:20 Still no sign of Palmer with 10 minutes to go. Maldonado has set his first time, a 1m29.184s lap to be 17th. 09:21 LAWRENCE BARRETTO: "There was a delay in Lotus receiving its tyres for this weekend because of issues with its agreement with Pirelli. It is understood payment was delayed. That was sorted this morning with the tyres being delivered just an hour before the session started. Pastor Maldonado did an installation lap, as did Jolyon Palmer, before spending most of the session in the hospitality." 09:21 Maldonado slithers off the road at Turn 12, and he's also struggling like Ricciardo was in the final corner. The troubles continue as he sails wide at Turn 1 as well. 09:21 Kvyat says he has "no grip left on the rears". 09:21 We also haven't seen Hulkenberg since the restart, following team-mate Perez's accident. 09:21 Stevens improves, breaks the 1m30s barrier with a 1m29.693s. He's still 18th. 09:23 Rosberg improves again, he's now 0.109s behind Hamilton. 09:24 The McLarens are currently 11th and 12th, Massa 14th. 09:24 Palmer is now out on track. 09:24 It's a Ferrari engines 1-2-3 in the speed trap at the moment, with the Saubers heading Raikkonen. The works Mercedes are eighth and ninth in that ranking, almost certainly running more wing than their pursuers. 09:24 More dramas for Ricciardo - a big lock-up at turn 1. 09:24 Raikkonen pits with a punctured left front tyre and his front wing missing. 09:25 There's debris on the track at Turn 12, but we're yet to see what happened. 09:25 Bizarre! Raikkonen's front wing simply collapsed as he ran over the sore-tooth exit kerb at Turn 12. Very strange. 09:26 Verstappen says he has "no grip left on the tyres," as seems to be the theme of the day. 09:26 Cars run over those sorts of kerbs all the time, usually without any sort of failures along those lines. 09:27 Rosberg is told "we won't have time to run again." 09:27 We had marshals clearing the track with brooms earlier, but so far those at Turn 12 only have their hands and feet to use. Not quite as effective. 09:29 Rosberg isn't the only driver told that he shouldn't expect to head back out. With 60 seconds left on the clock, we're seeing drivers up and down pitlane getting out of their cars. 09:30 Those who stayed in their cars have been able to head back out, albeit briefly. Green flag with 30 seconds remaining. 09:30 Ricciardo, Bottas, Massa, Maldonado and Palmer went out for what will be an outlap and then an inlap, with the chequered flag now flying. 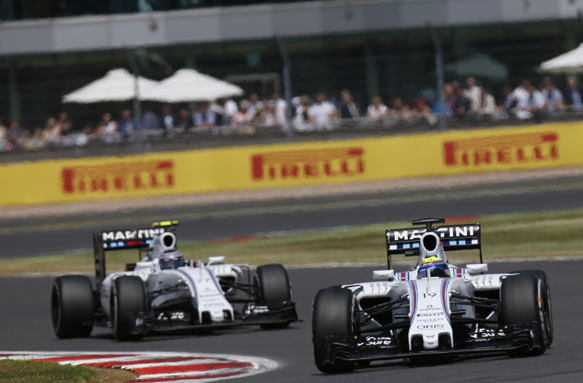 09:31 Bottas is told "if you can get over the timing line then we can get in a start, make sure you cross the line." 09:32 That brings us to the end of a session that featured a pair of unusual incidents. 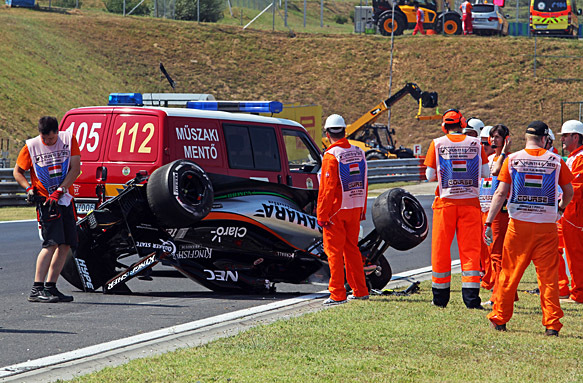 09:32 The first was Perez's roll in the Force India, due to a right-rear suspension failure. Fortunately the Mexican driver emerged unscathed. 09:33 And then, in the closing minutes, Raikkonen's Ferrari shed its front wing over a kerb. 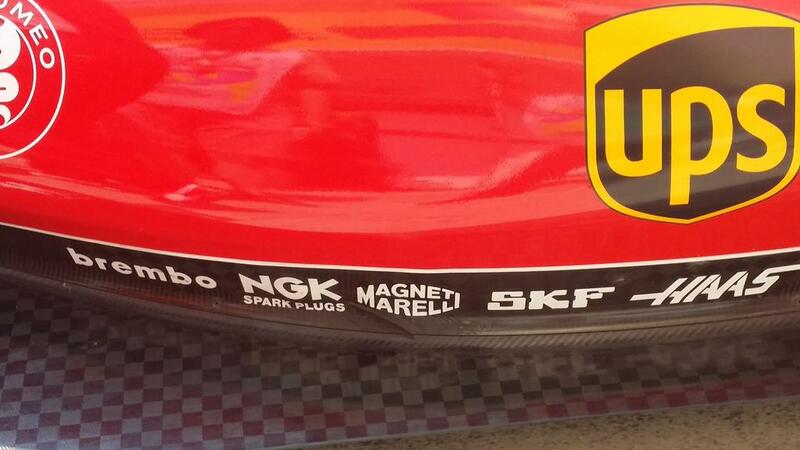 09:33 The core of the wing looks in tact, and Ferrari will no doubt retrieve it from the marshals down at Turn 12. 09:39 Palmer didn't log a time in Grosjean's Lotus. The team had a delayed start to the session due to what's believed was a payment-related delay in receiving its tyres from Pirelli. 09:40 Hulkenberg didn't reappear following Perez's crash, understandably, while Force India investigated the cause of the right-rear failure. 09:43 Verstappen was the busiest driver of the session, turning 26 laps. 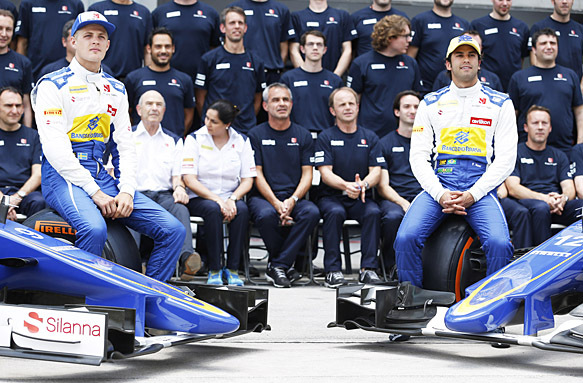 Team-mate Sainz completed 24, Raikkonen and Nasr turned 23. 09:43 At the front, Hamilton completed 18 - despite not running during the middle phase of the session, and Rosberg 21. 09:44 Just 0.109s between the Mercedes pair. A casual 0.671s between Hamilton and Raikkonen in third, nearly three tenths more back to Red Bull. 09:48 Thanks for joining us this morning, we'll be back for second practice from 13:00 BST this afternoon. 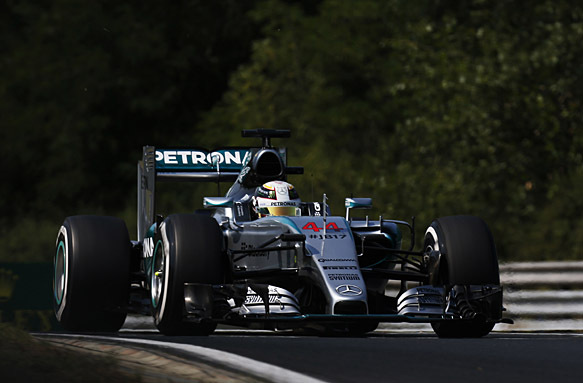 11:48 Welcome back to AUTOSPORT's live coverage of the Hungarian Grand Prix. 11:49 We're about 10 minutes away from second practice and apologies to those of you reading in the UK, but it's a sunny 31C in Budapest. 11:50 The track temperature is also up to a lazy 53C, both figures are up on what teams faced this morning. 11:50 @JolyonPalmer: "Frustrating start to the weekend, only 4 install laps. On the positives at least @RGrosjean was happy to have a Friday lie in for once!" 11:52 Between sessions, GP2 has been out for its Hungaroring practice session. It was another good one for McLaren's protege Stoffel Vandoorne. 11:54 As a result of this morning's disruptions, FP2 will become even more important for teams up and down pitlane. 11:56 And especially important for Lotus after it missed most of FP1 due to delays in getting its hands on tyres, understood to be payment-related. 11:59 Of course, Grosjean will be back in his Lotus, and Merhi back in his Manor, after Palmer and Leimer's FP1 runs. 12:00 The session is underway, Stevens is the first to head out. 12:01 He's followed closely by Merhi and Button. The McLarens were a relatively promising 11th and 12th this morning. 12:03 Don't look to see either Force India any time soon. @ForceIndiaF1: The investigation on the causes of Checo's crash is still ongoing - neither Nico nor Checo will take part in FP2 at this stage. 12:04 Some rare TV airtime for Manor there, as the other teams take their time joining the backmarkers on track. 12:04 Merhi sets his first time of the weekend, a 1m32.790s. Stevens logged a 1m38s, while Button pitted. 12:05 Rosberg, Raikkonen and Vettel are now heading out, along with Maldonado and Sainz. 12:05 Verstappen, Grosjean and Hamilton join their team-mates on track. 12:06 Rosberg is warned to "avoid doing a practice start in the fast lane", following a reprimand handed to Perez after first practice. 12:07 Ericsson and Alonso join the fun. 12:08 Vettel is the first of the front-runners to set a time, it's a 1m28.549s. Maldonado laps within two tenths. 12:08 Raikkonen has been working the tyres hard at the beginning of this run, seemingly trying to build temperature. It doesn't look like it worked, as he locked up at Turn 1 and ran wide. 12:08 Sainz goes fastest on a 1m27.884s, while Rosberg and Raikkonen logged slow laps. 12:09 Next time around, Raikkonen improves to a 1m28.096s, while Verstappen is now third. 12:10 Laps - albeit not representative - logged by Hamilton and Ericsson. No sign of either Red Bull or Williams yet, along with the Force Indias. 12:11 Raikkonen asks "do we have a tail wind", which is followed up by a quick "confirm." 12:11 Vettel goes to the top with a 1m27.887s as drivers deal with the slippery track surface. 12:12 Kvyat, Bottas and Massa are now on track. 12:12 Hamilton is pushing on this lap, and he has a small lock-up into Turn 12 just to illustrate that point. 12:12 Hamilton goes top with a 1m26.132s. 12:13 That's about a second off the times we saw this morning. Hamilton topped this session last year with a 1m24.482s effort. 12:14 Ericsson informs his team that "there is no grip, I'm just sliding everywhere." 12:15 Kvyat has a slightly messier lock-up than Hamilton's into Turn 12. 12:15 Kvyat still goes second, though, with a 1m26.330s. 12:16 Rosberg sets his first meaningful time, a 1m26.572s. He's third, behind Hamilton and Kvyat, and ahead of the Ferraris. 12:16 Rosberg was chopped by a Lotus in the penultimate corner on the previous lap, and Bottas has been off at Turn 4. Action-packed out there at the moment, and Rosberg joins the fray with a lock-up of his own at Turn 1. 12:18 Not to be outdone by his team-mate, Hamilton has a much bigger lock-up into Turn 1 than Rosberg did. 12:18 Ricciardo is out for the first time this afternoon, while Button has returned to the track. 12:20 Hamilton says that his tyres "are cooking out here", while Verstappen tells Toro Rosso that he has "a very strange sound coming from the engine down the straight." 12:20 Button goes 10th, just behind team-mate Alonso, with his first time of the session, a 1m28.103s. 12:21 Rosberg, meanwhile, has gone second, witha 1m26.168s lap, just 0.036s off Hamilton. 12:21 Only for Hamilton to find half a second, with a 1m25.613s lap. 12:22 Ricciardo's first lap looked scrappy, but it's still good enough for second, four tenths down on Hamilton. 12:22 Rosberg says that he can feel "quite a lot of understeer" in the slow speed sections. 12:22 Team-mate Kvyat had a big lock-up into Turn 2, on the same lap, while replays show Hamilton's earlier moment into Turn 1. 12:24 We have a quiet track at the moment, only Ricciardo and Buttonout there, as we approach the half-hour mark. 12:26 Button pits, Ricciardo does the same. 12:27 The track falls silent briefly, however Raikkonen has headed out. 12:29 And the bottom half, without two Force Indias. 12:29 Raikkonen is out on the softs, and fastest of all through the first two sectors. 12:30 The first front-runner time we've seen on the soft tyre, Raikkonen goes fastest with a 1m25.134s. 12:31 The Saubers are also out on the soft tyres. 12:31 Ericsson's having a tough time on the softs, missing apexes and running off track at Turn 4 - with the difficulties from that moment continuing into Turn 5 as well. 12:32 Ericsson goes sixth-fastest, despite that, with a 1m26.330s. 12:33 Rosberg has headed out on the softs, too. 12:33 As has Sainz, Grosjean and Maldonado. Here come the qualifying sims. 12:34 Nasr, meanwhile, has displaced team-mate Ericsson in sixth. His time was 1.398s off Raikkonen's effort. 12:34 Grosjean is far from the only driver struggling out there, locking up into Turn 2. 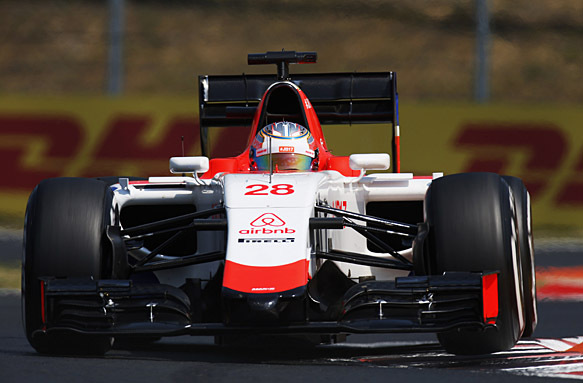 12:35 Grosjean jumps from 15th to eighth, splitting the Saubers. 12:35 Sainz has now gone second, four tenths behind Raikkonen. Hamilton and Rosberg are starting their laps now. 12:35 And Maldonado is now fifth. 12:35 Hamilton is told "we are seeing a big gain on this tyre, around two seconds." 12:35 At this rate, we can expect lots of drivers to claim afterwards their laps were marred by low-grip errors, so we might not get a particularly accurate 'ultimate pace' picture once these soft tyre runs are complete. 12:35 Hamilton goes off at Turn 4, and abandons the lap. 12:36 We currently have 14 cars on track on the soft, only Ricciardo, Verstappen, Alonso and Merhi in pitlane. 12:37 Rosberg goes top, a 1m24.668s. 12:37 That's 0.466s up on Raikkonen, although Hamilton is purple in the first sector on his second lap. 12:38 He goes top with a 1m23.949s. 12:38 That's a casual 0.719s up on Rosberg. 12:39 Kvyat goes P2, splitting the Mercs, his lap was 0.351s off Hamilton. 12:39 LAWRENCE BARRETTO: "Lewis Hamilton's leading time is half a second quicker than the best time in this session last year, which was incidentally set by Hamilton." 12:39 Ricciardo is out on the soft tyres now, too. 12:40 Remarkably, Kvyat was up on Hamilton's time after sector 2, but he lost a lot of time in the final three corners. 12:40 Vettel spins at Turn 12. 12:41 The Ferrari is quick to rejoin from the asphalt run-off on the outside, Vettel having lost the rear mid-corner at low-speed. 12:41 Hamilton's looking for more time, he's fastest again through the first sector. 12:41 But there's nothing left in the tyre, he's slower through the second and third sectors and doesn't improve. 12:42 Ricciardo goes P3, with personal bests in all three sectors. He's logged a 1m24.451s lap, half a second off Hamilton, 0.15s off Kvyat. 12:42 Alonso, meanwhile, has moved up to seventh. 12:43 We still have about half of the field on track, but cars are slowly returning to pitlane with those soft-tyre runs complete. 12:43 Only Raikkonen has headed back out on the compound, albeit with a scrubbed set. 12:44 Button has lost one of his mirrors, he reports. 12:44 After his earlier spin, Vettel regroups to log a time, but it's only good enough for seventh, a 1m25.660s. 12:45 Only Ricciardo, Alonso and Merhi on track at the moment. 12:45 Alonso reports that his brakes "feel very strange" and asks McLaren to check their performance. @MercedesAMGF1: "Those bulls are looking rather feisty out there"
12:47 We're halfway through the session, here's how it looks after those soft runs. 12:47 @ScuderiaFerrari: "#Seb5 spun while doing his fast lap, no problems reported"
Of course, we don't see the Force Indias this afternoon. 12:50 Summarising those times, only the Red Bulls are within a second of Hamilton's lead Mercedes. Vettel will have taken some life out of his tyres with that spin and likely been higher than seventh. The Williams pair are a fraction under two seconds off Hamilton's pace, and actually behind a McLaren for what must be one of the first times this year. 12:51 With 40 minutes to go, we have Sainz (on scrubbed softs) and Merhi (on his first set) out on track. 12:51 Merhi, who sat out FP1, puts a moment on the previous lap behind him to edge past team-mate Stevens for 17th. By just 0.002s. 12:53 Raikkonen heads back out on the medium compound, while Bottas, Massa and Grosjean have rejoined on used soft tyres. @pirellisport: That performance gap between soft and medium is something in the region of 1.8 seconds. 12:56 Hamilton's back out on used soft tyres. 12:57 He heads straight back in, driving through pitlane to conduct a practice start, as Rosberg heads out. 12:59 An observant Raikkonen notes there is now "so much rubber" down in the practice start area that he tried to roll forward to get away from it before performing his own. 13:00 That's wise from Raikkonen, as none of the grid slots on Sunday will be full of rubber in the same way, so there will be less grip. 13:00 Ericsson is told "don't hold back" on the next lap. 13:01 Grosjean's had a spin at Turn 13, but he reports "all ok". 13:03 "I think I was going too fast", mocks Ricciardo, as he confirms his engine has "gone." 13:03 Sainz says he is "unhappy" with understeer in his Toro Rosso. 13:03 As Ericsson battles a troublesome Sauber that does not look comfortable here, Hamilton's Mercedes breezes past him, highlighting the difference between the two cars. 13:03 Ricciardo, on his seventh lap on the soft, recorded a 1m28.298s, while Hamilton rolled out a 1m28.739s on the 11th lap on his tyres. 13:05 A 1m28.560s for Hamilton that time around, and a 1m28.218s for Ricciardo, as they do race prep. Raikkonen, on the medium, turned a 1m29.939s. 13:08 The Red Bull's softs appear to be holding up well this stint, a 1m28.288s for Ricciardo (10 laps in). Hamilton had an off at Turn 13 on his way to a 1m30.018s (13 laps in). 13:09 Just as we're talking about how well Red Bull is doing in this session, Ricciardo's engine expires and he parks up in a cloud of smoke. 13:10 That was a proper blow-up, and it sounded horrible from the onboard camera. 13:11 Panic on the Red Bull pitwall - Kvyat reports smoke and oil, is told to stop, then points out he's talking about Ricciardo's car! 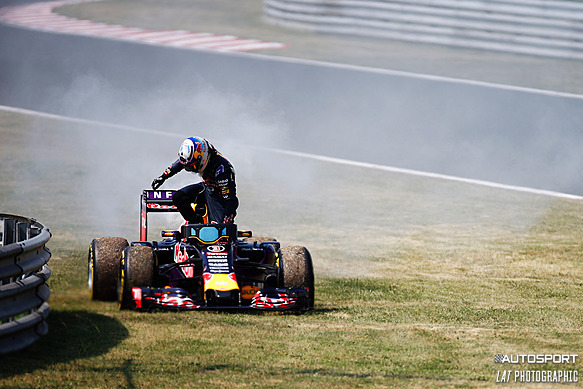 13:13 Ricciardo's car is being taken away by a tractor, so the track will shortly be clear. Some teams are expressing concern about oil on the track. 13:13 "I think I was going too fast", mocks Ricciardo, who confirms his engine has "gone." 13:13 Our tech expert CRAIG SCARBOROUGH is patrolling the pits, and checking out the Hungaroring tweaks. 13:15 We have a restart with 15 minutes remaining. 13:17 The bulk of the field has headed back out on their used soft tyres. Of the cars that could be running, only Raikkonen is in pitlane. 13:17 Rosberg catches some traffic (Button) and has a big moment into Turn 12, so he backs off. 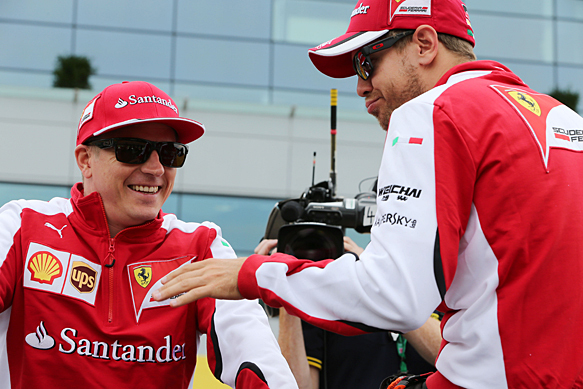 13:17 Vettel, Massa, Maldonado and Nasr are the only drivers running the medium compound. 13:20 Vettel spins at Turn 1, having just been told to push but avoid kerbs in Turns 6/7. 13:20 Kvyat complains about traffic ahead, and says that Ericsson "is not a very nice guy." 13:21 The Ferrari swapped ends on Vettel when he hit the brakes for the first corner. 13:22 Rosberg has swapped the softs for a used set of medium tyres, with 10 laps on them and headed back out. 13:24 Good news for Red Bull and Ricciardo fans. And neutrals keen to see if he can take the fight to Mercedes on Sunday. @redbullracing: Daniel back in the garage after an engine issue. It was not his race engine, so no grid penalty. 13:25 Brake-by-wire worries at Sauber. Ericsson is informed not to "risk putting the car in the wall" because the system has gone into fail-safe mode. 13:26 Hamilton has switched back to the medium tyres as well. Team-mate Rosberg just logged a very precise 1m30.000s lap, as he navigates traffic. 13:29 A 1m28.498s for Hamilton that time around, to Rosberg's 1m28.820s on tyres two laps older, as the clock winds down. 13:30 The chequered flag is now flying. 13:33 Some final pitstop practice as drivers file into pitlane at the end of the session. We didn't see either Force India, as the team investigates the cause of Perez's suspension failure this morning. 13:36 One of Red Bull's best days of the season, with Kvyat second and Ricciardo third, the only team within a second of Hamilton. 13:36 Ricciardo was good on the soft tyre in a race sim, and while his day ended with an engine failure, it wasn't a race unit, so no grid penalty. 13:37 Vettel had a bit of a scrappy day, spinning on his first qualifying run, while Williams was ninth and 10th in another quiet Friday. 13:38 They were, though, the best part of two seconds off Hamilton, and behind Alonso's McLaren. 13:42 Thanks for following Friday practice with us, stay tuned for news and analysis from the paddock throughout the afternoon and evening. 13:43 And we'll be back with AUTOSPORT live coverage of Saturday free practice from 10:00 BST.